(CNN) – The increasingly bitter battle for Florida’s Democratic Senate nomination reached a new height Sunday as billionaire Jeff Greene called Rep. Kendrick Meek’s ethics into question and urged his opponent to call for the resignation and return contributions from embattled Rep. Charlie Rangel, D-New York. A Meek campaign spokesman fired back calling Greene’s latest move a “stunt” intended to distract attention away from Greene’s recent political setbacks. 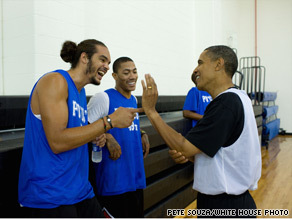 The president played basketball Sunday with a number of NBA players including Joakim Noah and Derrick Rose of the Chicago Bulls. Washington (CNN) - While the first lady and daughters Malia and Sasha were away this weekend, President Barack Obama has been enjoying what some have jokingly referred to as a bachelor's weekend with friends - golfing, playing basketball and grilling out on the South Lawn. The festivities are all part of a belated birthday celebration of sorts for the president, who turned 49 on Wednesday. First lady Michelle Obama and youngest daughter Sasha, 9, were on vacation in Spain, while 12-year-old Malia is attending camp. Friends from Hawaii, Chicago, Illinois, and college joined the president on Saturday at Andrews Air Force Base for a round of golf. The sports outings continued Sunday with a basketball game at Fort McNair where Obama - along with such NBA stars as LeBron James, Dwayne Wade, Grant Hill and Earvin "Magic" Johnson - played in front of an audience of wounded servicemen and participants in the White House mentoring program. Obama was scheduled to return to the White House Sunday evening with friends and some of the basketball players for a seafood barbecue on the South Lawn. (CNN) - The undersea gusher in the Gulf of Mexico has been brought under control, but the worst oil spill in U.S. history will continue to be felt along the Gulf Coast for some time, Obama administration officials said Sunday. 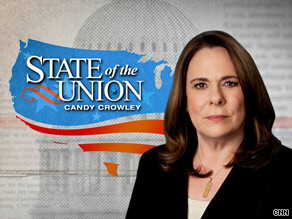 In her Crib Sheet, CNN's Candy Crowley wraps the news from Sunday's political talk shows. People? We Have to Deal with People? But, a big ole Fail on another front. As Allen explains it, BP is a “large global oil production company. They don’t do retail sales, or deal with individuals on a transactional basis…It’s something they don’t naturally have as a capacity or a competency…” We believe this is Coast Guard speak for BP has no people skills. The president's top environmental and energy adviser Carol Browner pronounced the government run environmental cleanup in the gulf “very successful” but added “there’s still a lot of work to do.” This will come as a relief in the Gulf where residents fear with the leak plugged, they are already in the country’s rear view mirror. Republican Leader John Boehner (Ohio) went after the Obama administration for wanting to let the Bush tax cuts expire in January for the wealthy ($250,000 and up households). 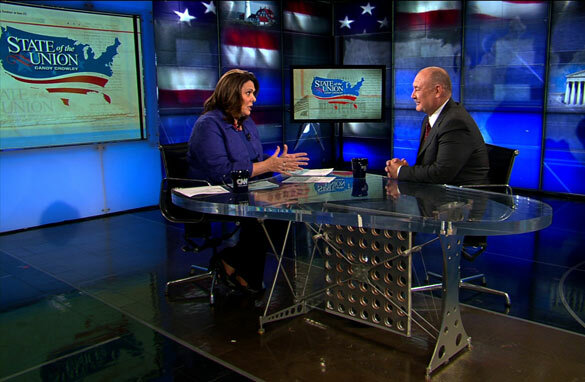 He argued GOP economics 101: Don’t raise taxes in a struggling economy. Asked repeatedly, Boehner would not say whether keeping those tax cuts in place simply adds to the deficit republicans are so eager to reduce. It may be time to posit the question: In arguing for keeping tax cuts for the wealthy, has the GOP found a potent election year issue or are they boxing themselves in? 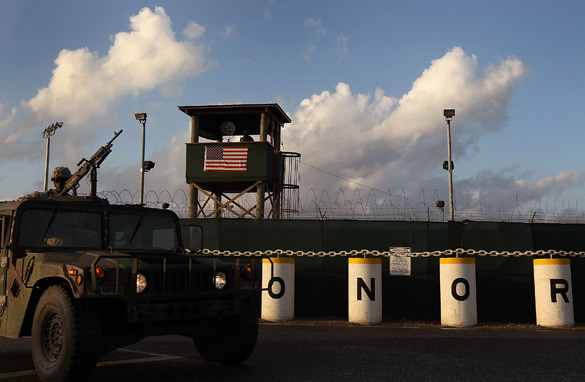 Guantanamo Bay, Cuba (CNN) - Final preparations were underway Sunday for what will be the Obama administration's first full military commission hearing, set to begin this week. A few hours after an 8 a.m. recording of the national anthem that blared across Guantanamo's Camp Justice, attorneys for the Military Commission - both prosecutors and defense attorneys - met with judges to plot out the procedures and schedules of what could play out in the courtroom this week. His Pentagon-appointed lawyer, Lt. Col. Jon Jackson, tried and failed to have the trial stopped - the Supreme Court denied his request Friday. And depending on the time devoted to a variety of motions, the trial could begin as soon as Monday. 'A lot of them came here just so their children could become U.S. citizens,' House Minority Leader John Boehner said of undocumented immigrants in a television interview Sunday. Washington (CNN) - Changing the Constitution's guarantee of U.S. citizenship for anyone born in the United States is "worth considering" if it helps reduce illegal immigration, the Republican leader in the House of Representatives said Sunday. "It's a serious problem that affects our country, and in certain parts of our country clearly our schools, our hospitals are being overrun by illegal immigrants. A lot of them came here just so their children could become U.S. citizens. 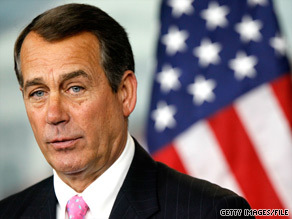 They should do it the legal way," House Minority Leader John Boehner told NBC's "Meet the Press." The Ohio congressman, who could become speaker of the House if Republicans win back control of the chamber in November, is the latest GOP leader to float the idea of changing the 14th Amendment. Several leading GOP senators, including Minority Leader Mitch McConnell and 2008 presidential nominee John McCain, have said they would support holding hearings into the matter as part of the heated debate over immigration. (CNN) – In a preview of Democratic and Republican talking points on what are likely to be major issues in this fall’s midterm elections, Michigan Gov. Jennifer Granholm and Virginia Gov. 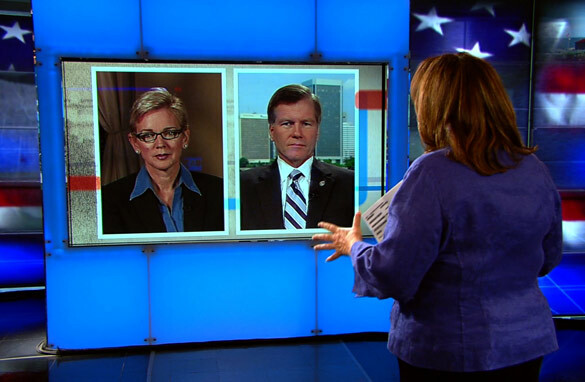 Bob McDonnell sparred Sunday in an interview that aired on CNN’s State of the Union. As the House prepares to return early from recess in order to vote on a $26-billion state aid bill passed by the Senate last week, McDonnell, a Republican, slammed the measure as an example of excessive federal spending. Gov. Granholm, by contrast, defended the latest state aid bill along with earlier efforts by Capitol Hill to help out cash-strapped state and local governments“There is no doubt that this has been critically important money for us, as we make our way through this recession,“ Granholm, a Democrat, said of the federal aid her state has received in the recent tough economic times. Washington (CNN) - Voters in Indiana's 2nd district will likely have one thing on their minds as they cast ballots this fall: the economy. The district has been hit especially hard by the economic turmoil of the last two years. Although unemployment is down from its 2009 highs for most of the 12 counties that make up the district, all but two counties still face unemployment rates of 10 percent or higher. The district's economic struggles have not been lost on President Obama. He campaigned here in 2008 and returned on multiple occasions while in office. 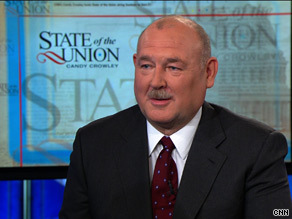 Retired Coast Guard Adm. Thad Allen spoke with CNN Sunday about lessons learned from the Gulf oil spill. Washington (CNN) – As he reflects on lessons learned from dealing with the Gulf oil spill, the man charged with leading the federal response gave embattled energy giant BP a mixed grade Sunday. Asked on CNN’s State of the Union to give BP a grade from “A” to “F,” retired Coast Guard Adm. Thad Allen separately assessed different aspects of the company’s response to the blown out well. But Allen quickly added that where the energy giant’s performance has been lacking is in having a human touch.